Instagram, this social network based entirely on image sharing has been a success, launched in October 2010, which counts more than 100 million registered today, including some 7.5 million active users daily . The company was acquired by Facebook on April 9, 2012. 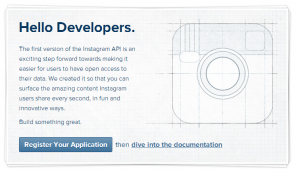 Mainly used since Android and iOS smartphones , Instagram has recently proposed an API to develop sites and applications using their resources to open up new possibilities for users. We will see through this article, a mini-tutorial, how to exploit this API. Before starting to develop, you need an Instagram account, if you do not already have one, I invite you to create one from your Smartphone by downloading the application, it is the only solution for the moment to create an Instagram account. -The URI redirect address, the page to which the users will be returned after accepting or refusing to authenticate. 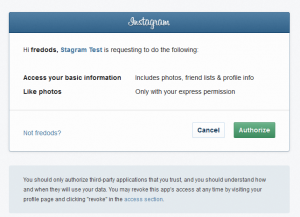 Once your application is registered, Instagram will give you a CLIENT_ID and a CLIENT_SECRET specific to your application, you will need it for the rest of the adventure. Taking care to replace the CLIENT-ID and REDIRECT-URI with those you generated the Instagram application. By default, you have access to the basic permissions to access all the member’s photos, profile information, subscriber list and subscriptions. So remember to predict the error where the user does not accept the error. Once this code is received you will need to perform a CURL operation to have a valid token. At the moment Instagram does not assign any expiration date to the token you will receive, but it is best to guard against some future future updates. What Is It Support And Why Do We Need It?